One needs only to catch the first few licks of “Open Your Eyes, You Can Fly” to know this album represents an era that can never be recaptured. Burton does wonders with the Chick Corea tune, lifting its upbeat soul to the greatest heights of creative pleasure. One can almost taste the freshness of his sound, the sheer newness of vision and synergy of musicianship ingrained into every moment of this phenomenal record. This was another early disc that managed to fall under my radar until I sought to review it. Burton is always a supreme joy to listen to, and with this, his second ECM appearance, he certainly made a profound statement. Burton himself contributes one composition, the enchanting “Brownout,” which takes full advantage of the rhythmic precision of his backing trio for a deft volley of restraint and abandon. Two Gordon Beck tunes provide the most robust flavors in this thickening stew, balancing the smooth full-ensemble nosh of “Tying Up Loose Ends” with the infectious full course of blistering key changes and nimble flair that is “Mallet Man,” the album’s centerpiece. The ballads are haunting and moody. “Coral” (Keith Jarrett) proves just how soulful vibes can be, while “Olhos De Gato” (Carla Bley), with its seedy undercurrent and humid climate, slinks like its namesake, stalking the edges of the night. Two Mike Gibbs tunes, “Four Or Less” and “Nonsequence,” round out the set on a more playful note, making dramatic use of pauses and a wider variety of textures. 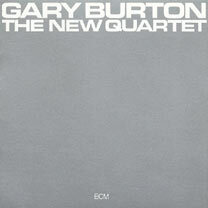 Gary Burton is synonymous with the vibes. And while I had long been one of countless admirers of his technical and melodic acuity, this album was nothing short of a revelation for me. The technique is flawless all around and glistens with Burton’s Midas touch. He contacts his instrument like fingers walking up a spine, never missing a single nerve along the way. Yet one cannot commend this album without also praising Goodrick’s phenomenal guitar work, Laboriel’s quick-witted ornaments, Blazer’s unrelenting dedication to the moment, and the astounding unity the ensemble as a whole manages to uphold. The overall balance comes across as joyously democratic, and all with a fresh-off-the-boat sound that surprises at every turn. There isn’t a single errant note, gesture, or idea to be found on The New Quartet. From start to finish, an inimitable achievement.